Offering you a complete choice of products which include brasso printed saree satin patta and brasso designer printed saree. Graceful and Gorgeous,This all coloured silk Saree for Indian Women from the house of Vatsla Enterprise.We are an unparalleled name in offering a wide of Fancy Party Wear Saree, Designer Sarees. The offered saree is crafted with the help of premium quality fabric and modular embroidery machines under the visionary guidance of trained professionals. 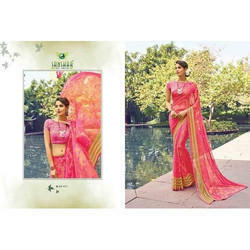 Our offered saree is worn to special parties, fashion shows, festivals and marriage ceremonies as ethnic wear. Further, this saree can avail by our clients in different colors, shades, patterns and designs for our clients to choose from. Looking for Brasso Printed Saree ?